Publications — Jen Romano Bergstrom, Ph.D.
Usability Testing for Survey Research (2017) provides researchers with a guide to the tools necessary to evaluate, test, and modify surveys in an iterative method during the survey pretesting process. It includes examples that apply usability to any type of survey during any stage of development, along with tactics on how to tailor usability testing to meet budget and scheduling constraints. Eye Tracking in User Experience Design (2014) explores the many applications of eye tracking to better understand how users view and interact with technology. Ten leading experts in eye tracking discuss how they have taken advantage of this new technology to understand, design, and evaluate user experience. Real-world stories are included from these experts who have used eye tracking during the design and development of products ranging from information websites to immersive games. They also explore recent advances in the technology which tracks how users interact with mobile devices, large-screen displays and video game consoles. Methods for combining eye tracking with other research techniques for a more holistic understanding of the user experience are discussed. This is an invaluable resource to those who want to learn how eye tracking can be used to better understand and design for their users. Romano Bergstrom, J. C. (2016). Internal Consulting: Best of Both Worlds. In C. Lebson, UX Careers Handbook. Boca Raton, FL: CRC Press. Romano Bergstrom, J. C. (2015). The Challenges and Benefits of Iterative Usability Testing. In R. Gautam & T. Rotolo, This SUX! A Guide to Better User Experiences. San Mateo, CA: TryMyUI, Inc.
Romano Bergstrom, J. C., Duda, S., Hawkins, D., & McGill, M. (2014). Physiological Response Measurements. In J. Romano Bergstrom & A. Schall (Eds. ), Eye Tracking in User Experience Design. San Francisco, CA: Morgan Kaufmann. Jarrett, C. & Romano Bergstrom, J. C. (2014). Forms and Surveys. In J. Romano Bergstrom & A. Schall (Eds. ), Eye Tracking in User Experience Design. San Francisco, CA: Morgan Kaufmann. Loos, E. & Romano Bergstrom, J. C. (2014). Older adults. In J. Romano Bergstrom & A. Schall (Eds. ), Eye Tracking in User Experience Design. San Francisco, CA: Morgan Kaufmann. Eye tracking heat map shows that young adults fixate the left navigation and center of the screen when completing a task on this Website. Mendelson, J., Gibson, J. L., & Romano Bergstrom, J. (2016). Displaying videos in web surveys: Implications for complete viewing and survey responses, Social Science Computer Review, in press. Bol, N., Van Weert, J. C. M., Loos, E. F., Romano Bergstrom, J. C., Bolle, S., & Smets, E. M. A. (2016). How are online health messages processed? Using eye tracking to predict recall of information in younger and older adults. Journal of Health Communication, 21 (4), 387-396. Romano Bergstrom, J. C., Lakhe, S., & Erdman, C. (2016). Next belongs to the right of Previous in web-based surveys: An experimental usability study. Survey Practice, 9 (1). Romano Bergstrom, J. C., Olmsted-Hawala, E. L. & Bergstrom, H. C. (2016). Older adults fail to see the periphery during website navigation. Universal Access in the Information Society, 15, 2, 261-270. Luchman, J. N., Bergstrom, J. C., & Krulikowski, C. (2014). A motives framework of social media website use: A survey of young Americans. Computers in Human Behavior, 38, 136-141. Romano Bergstrom, J. C., Hackenbracht, J., & Gibson, J. (2014). Measuring propensity to join the Military: Survey data are consistent regardless of response option order. Survey Practice, 7, 2. 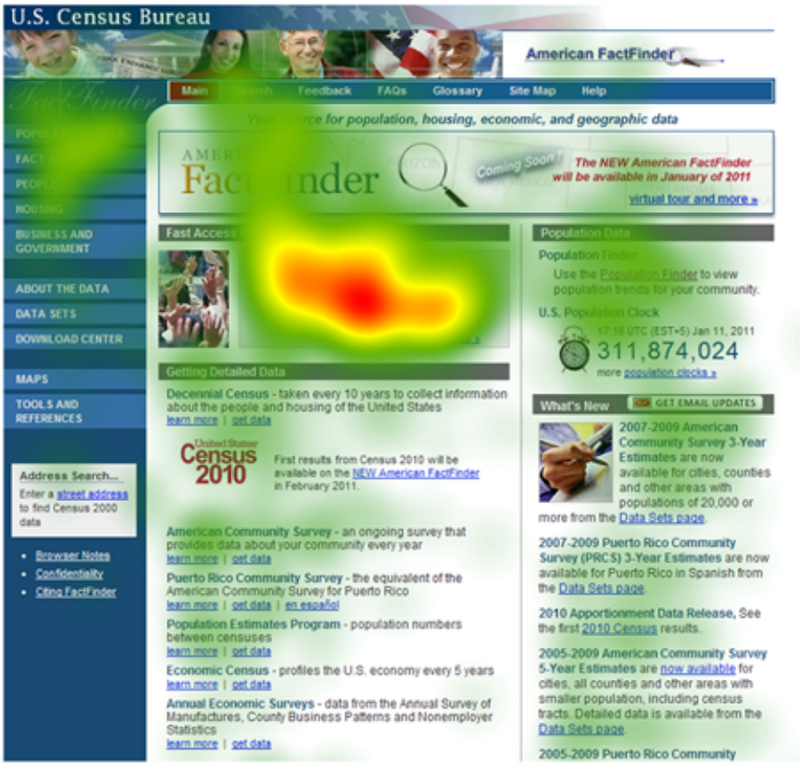 Eye tracking heat map shows that older adults fixate the center of the screen when completing a task on this Website. Romano Bergstrom, J. C., Childs. J. H., Olmsted-Hawala, E., & Jurgenson, N. (2013). The efficiency of conducting concurrent cognitive interviewing and usability testing on an interviewer-administered survey. Survey Practice, 6, 4. Romano Bergstrom, J. C., Olmsted-Hawala, E. L. & Jans, M. E. (2013). Age-related differences in eye tracking and usability performance: Web site usability for older adults. International Journal of Human-Computer Interaction, 29, 541-548. Romano Bergstrom, J. C., Olmsted-Hawala, E. L., Chen, J. M., & Murphy, E. D. (2011). Conducting iterative usability testing on a Web site: Challenges and benefits. Journal of Usability Studies, 7, 9-30. Romano Bergstrom, J. C., Howard, J. H. Jr., & Howard, D. V. (2011). Enhanced implicit sequence learning in college-age video game players and musicians. Applied Cognitive Psychology, 26, 91-96. DOI: 10.1002/acp.1800. Romano, J. C., Howard, J. H. Jr., & Howard, D. V. (2010). One-year retention of general and sequence-specific skills in a probabilistic, serial reaction time task. Memory, 18, 427-441. Bennett, I., J., Romano, J. C., Howard, D. V., & Howard, J. H. Jr. (2008). Two forms of implicit learning in young adults with dyslexia. Annals of the New York Academy of Sciences, 1145, 184-198. Bol, N. & Romano Bergstrom, J. (2015). Designing for Vulnerable Users: Illustrations (May) Help Understand Complex Health Websites. User Experience Magazine, 15(3). Salazar, S., & Romano, J. (2014). Spanish Language Personas: Informing the Design of Healthcare Websites. User Experience Magazine, 14(3). Romano Bergstrom, J. (2013). Moderating Usability Tests. Usability.gov, April 2013. Bol, N., Boerman, S., Romano Bergstrom, J. C., & Kruikemeier, S. (2016). An overview of how eye tracking is used in communication research. Proceedings from the Human Computer Interaction International Conference, July 2016, Toronto, Canada. Romano Bergstrom, J., Frisch, S. A., Hawkins, D., Hackenbracht, J., Greene, K., Theofanos, M., & Griepentrog, B. (2014). The impact of linguistic and phonological difficulty on memorizing and entering secure passwords on mobile devices. Proceedings from the Human Computer Interaction International Conference, June 2014, Crete, Greece. Walton, L., Romano Bergstrom, J., Hawkins, D., & Pierce, C. (2014). User experience testing and eye tracking inform paper diary design. Proceedings from the Human Computer Interaction International Conference, June 2014, Crete, Greece. Bol, N., Romano Bergstrom, J. C., Smets, E. M. A., Loos, E. F., Strohl, J., & Van Weert, J. C. M. (2014). Does Web Design Matter? Older adults’ attention to cognitive and affective illustrations on cancer-related websites. Proceedings from the Human Computer Interaction International Conference, June 2014, Crete, Greece. An example typical development lifecycle: UX testing can occur at any stage. Romano Bergstrom, J. C. & Strohl, J. (2014). Improving government websites and surveys with usability testing: A comparison of methodologies. Proceedings from the Federal Committee on Statistical Methodology (FCSM) Conference, Nov 2013, Washington, DC. Mendelson, L. & Romano Bergstrom, J. C. (2013). Age differences in the knowledge and usage of QR codes. Proceedings from the Human Computer Interaction International Conference, July 2013, Las Vegas, NV. Olmsted-Hawala, E. L., Romano Bergstrom, J. C., & Rogers, W. (2013). Age-related differences in search strategy and performance when using a data-rich Web site. Proceedings from the Human Computer Interaction International Conference, July 2013, Las Vegas, NV. Krulikowski, C., Romano Bergstrom, J., & Fischer, M. (2013). Making your brand Pinteresting to youth: Examining youth usage and adoption rates of Pinterest. Proceedings from the ESOMAR 3D Digital Dimensions Conference, June 2013, Boston, MA. Olmsted-Hawala, E. L. & Romano Bergstrom, J. C. (2012). Think-aloud protocols. Does age make a difference? Proceedings from the Society for Technical Communication Summit, May 2012, Chicago, IL. Romano. J. C. (2010). Using eye tracking to examine age-related differences in web site performance. Proceedings from the Human Factors and Ergonomics Society Annual Meeting, Sept 2010, San Francisco, CA.